THE easiest slow cooker taco meat recipe for large groups! 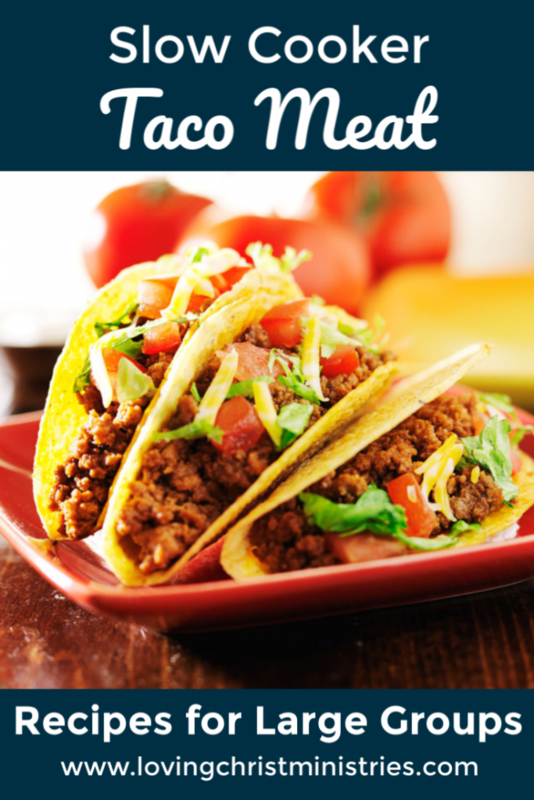 Our retreat ladies love taco night best of all, and this slow cooker taco meat recipe meant for large group cooking is one of the main reasons why! When we put the taco bar together, no one goes hungry. In addition to beef, we also offer our simplest shredded chicken as well. One crockpot full of this taco meat recipe can feed approximately 20. It can be stretched further on a taco bar with plenty of other toppings and options. We always add the extras like shredded cheese, lettuce, tomatoes, black olives, sour cream, and so on. We also make sure to offer both hard and soft shells. For a retreat with 50 ladies, we made one crock of shredded chicken and one of ground beef and had some leftover. Cook for 2-4 hours on HIGH or 6-8 hours on LOW until the meat is completely brown. Stir it once or twice throughout the cooking time to make sure the meat breaks up and doesn’t cook in a clump. Don’t forget to add extras to your meal like a salad bar and desserts. As a side note, my family loves this recipe too. I usually still make up the 2 lbs for them and we have leftovers, but you could cut the recipe in half very easily. The taco meat tastes great on baked potatoes, nachos, and just about anything else you can think of. Enjoy! Be sure to save this recipe to your favorite Pinterest board! Can you be a little more specific on about how many people this will be good for. Im having a nacho bar for 25 people. Will this be enough? Can you double this recipe and put in one large crockpot? This is perfect! I love tacos and have always wondered how people make them for large groups! Brittany, I’m so glad you find this helpful! Enjoy!